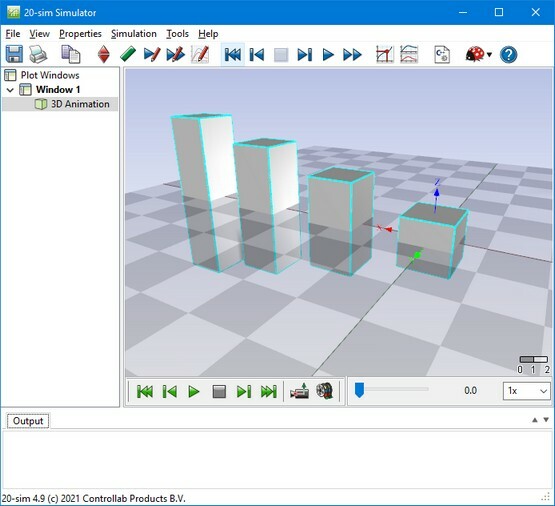 All objects in a 20-sim Animation can be duplicated. This property is useful when drawing a lot of the same objects. • Number of Duplicates: Select the number of duplicates of the object. • Position Offsets: Select the position offset of the first duplicate from the original object. This offset is repeated for every next duplicate. • Orientation Offset: Select the orientation offset of the first duplicate from the original object. This offset is repeated for every next duplicate. 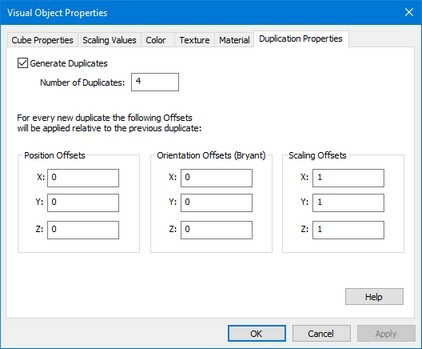 • Scaling Offset: Select the scaling of the first duplicate compared to the original object. This scaling is repeated for every next duplicate. The example below shows a cube that is duplicated according to the specifications given in the figure above. As shown, the first duplicate is a little larger than the original object. The second duplicate is a little larger than the first duplicate etc.